"Your work does matter to those who enjoy its fruits. Note the marketing appeal of advertising that uses the family kitchen and a mother's loving care and delightful interaction with her children. Household management provides a pattern of rituals for everyday life..."
* I'm sorry, I wasn't able to prepare features again as it has been a very busy few weeks. We hope to resume the following week. 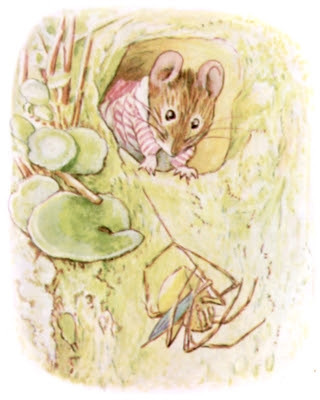 "When Mrs. Tittlemouse ventured to come out—everybody had gone away. But the untidiness was something dreadful—"Never did I see such a mess—smears of honey; and moss, and thistledown—and marks of big and little dirty feet—all over my nice clean house!" "Will it ever be tidy again?" said poor Mrs. Tittlemouse." 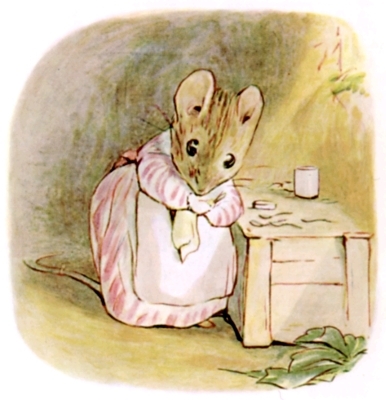 Poor Mrs. Tittlemouse indeed! She had been invaded by many unwelcome guests (of that un-thoughtful insect population) and was now left with quite a mess! However, she was a prudent little mouse and quite prepared. She simply walked into her stocked storeroom for the necessary housecleaning supplies. But no, dear reader!-- She did not reach for disposable paper napkins to wipe up those smears and smudges! 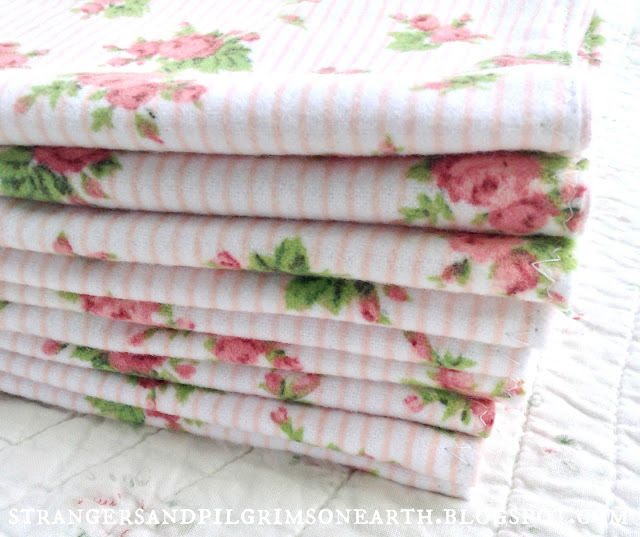 She was a frugal little creature and used her handmade flannel (un-paper) towels. Did you mention that you buy paper towels every week? Did you want to streamline the budget? 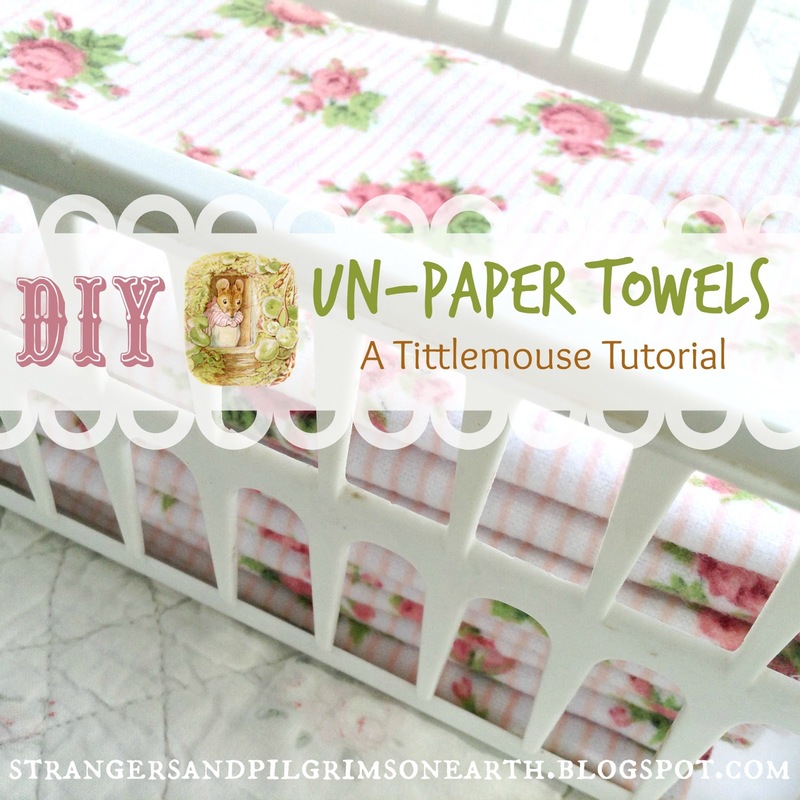 If so, follow along with Mrs. Tittlemouse's easy tutorial and you will be saving money in no time! We haven't purchased a paper towel in over 5 years and I must say it is splendid! 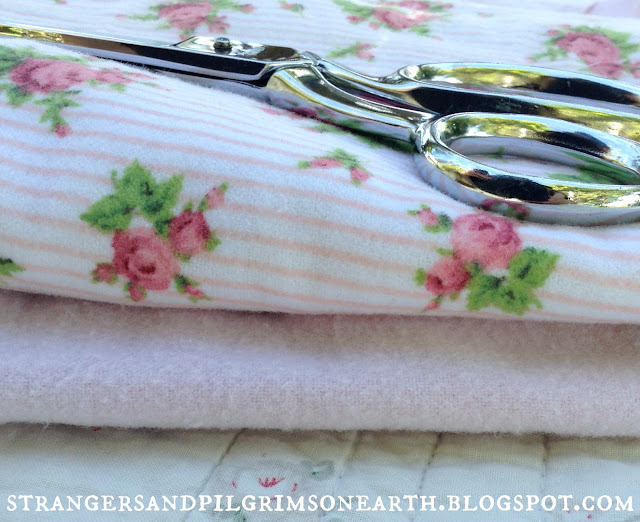 All you need are a few yards (or meters) of soft flannel (which is chosen because it is so absorbent), a pair of scissors, some sewing pins and a sewing machine (or needle and thread). The pattern we used was simply a regular piece of paper which measures out at 8 1/2 by 11 inches (which is near a common paper towel size). I also used a solid flannel on one side and my pretty print on the other in order to stretch the fabric I had on hand. 1. Gather your supplies (see list above). 2. Cut out your patterns (you will need a set of two pieces for each "towel" so you decide how many you would like to make). 3. Pin each set together with right sides facing each other (but leave a 5 - 6 inch opening so that you can get your hand inside to turn the fabric inside-out when you are finishing up). 4. & 5. Sew around all four corners (with a 1/4 inch seam allowance) except for your "opening" of 5 -6 inches. 6. Now place your hand inside and invert your fabric to the right side out. You should now have both of your nice sides showing. 7. 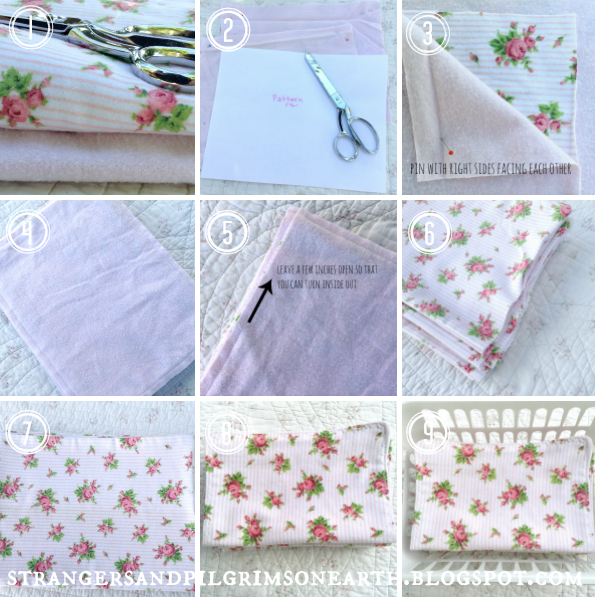 Iron down all your cloths and tuck in the opening seam area and pin the opening down in order to finish off the towel. 8. Now, do a zig-zag or fancy stitch around the entire edge of the napkin for a final finish. 9. Store in an easy to locate spot in the kitchen (mine are in a small plastic basket under the kitchen sink). These are great to use for those spills on the kitchen table and countertops (basically in areas where you don't want to use a "gross" rag from the rag bin). They are also nice for dusting and polishing furniture. Per Mrs. Tittlemouse, when you pair these with cloth napkins, you will no longer need to purchase paper disposables for your kitchen and that saves a mouse much money! If you are interested in doing this project, she would recommend preparing a stack of the "un-paper" towels in order for them to truly be a help in the household. 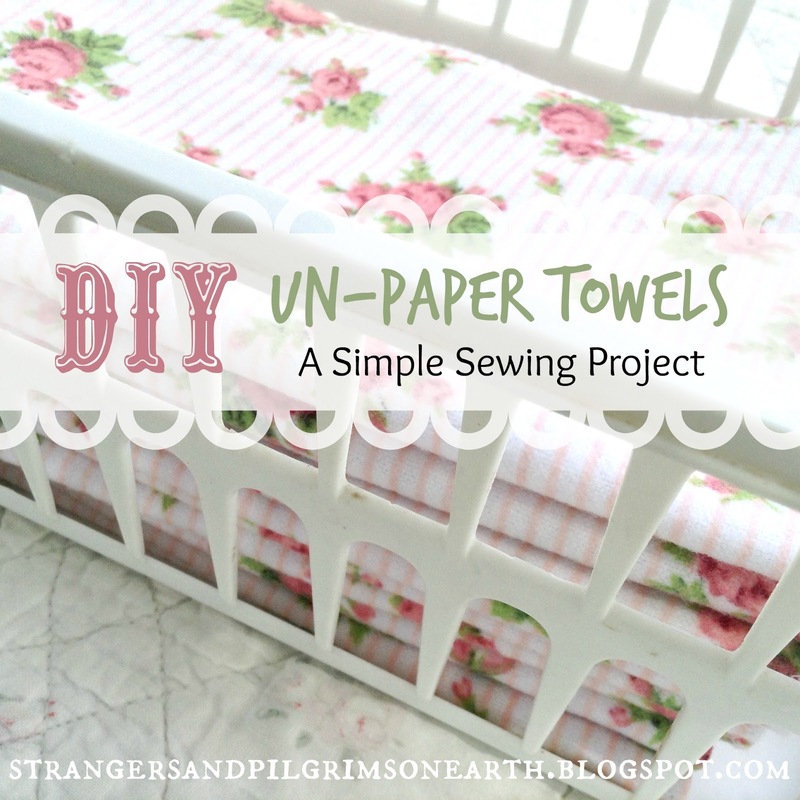 If you make just a few, you will be tempted to purchase paper towels in no time. 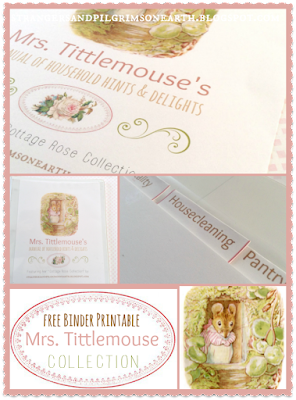 You may also be interested in Mrs. Tittlemouse's bug spray recipe and her cottage rose pantry labels. 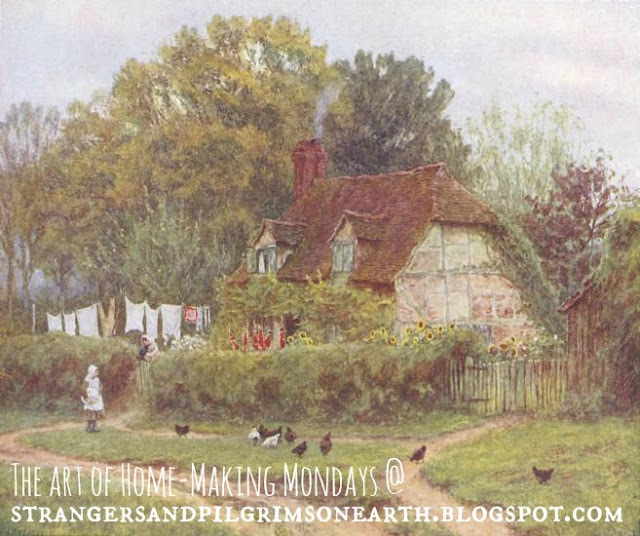 This post may be shared with some or all of the following link-ups: The Art of Home-Making Mondays, Modest Mom Monday's, Monday's Musings, Make Your Home Sing Monday, Good Morning Mondays, The Scoop, Titus 2sdays, Titus 2 Tuesdays, Tuesdays with a Twist, Raising Homemakers, Wise Woman Link Up, Homestead Blog Hop, Wow Us Wednesdays, Coffee and Conversation, Homemaking Thursdays, Home Sweet Home, Our Simple Homestead, From the Farm Blog Hop, Front Porch Friday Blog Hop, Awesome Life Friday Link Up, Shabbilicious Friday, Earth Day Blog Hop, Five Star Frou Frou Friday, Simply Natural Saturdays and Clever Chicks Blog Hop. Thank you lovely ladies for hosting these. There are five items in my life that I will spend money on (yes, I am about to get personal). Normally, dear reader, I am ultra-frugal... except when it comes to a good cup of coffee, hardcover books, quality dark chocolate, pantry jars and finally, essential oils (no, call me crazy but you won't find diamonds and jewels on this eccentric list). Essential oils are a huge part of our medicine cabinet! How many times in the middle of the night I am searching for the right oil to help that certain weird ailment and how many times I am rewarded with help. They are a big blessing to us and I have invested a pretty penny into them. It would only make sense to know how to store them properly and how long do these "medicinal jewels" really last? The answer to the last question has not been easy to find. 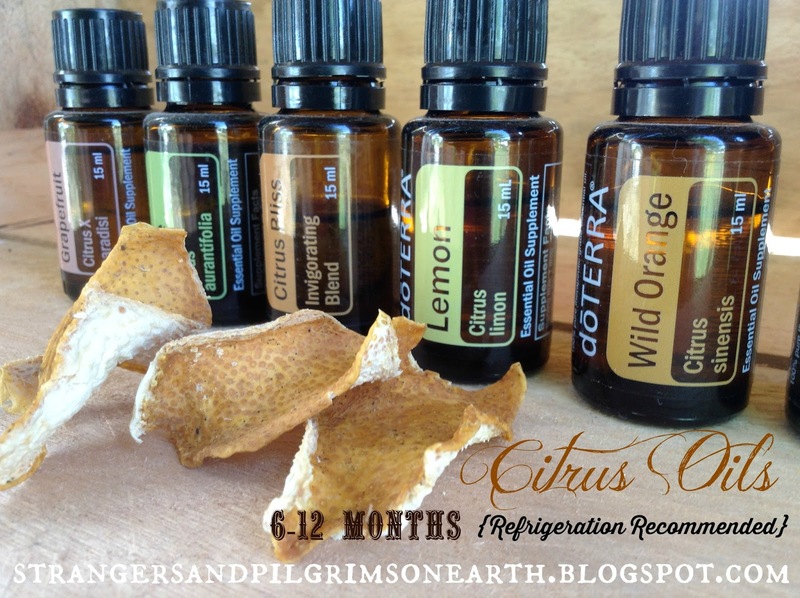 ~ Citrus oils are believed to have a shelf life of 6-12 months and should actually be stored in the refrigerator. ~ On the other hand, the "thicker" oils like vetiver, sandalwood and patchouli seem to enhance with age. "All doTERRA essential oils that are approved for internal use are required to contain a printed expiration date on their packaging. doTERRA cannot guarantee the oils after this date because essential oils naturally lose some of their potency over time. However, essential oils are very stable. We are currently conducting shelf life testing and have found no problems even after 5-10 years. Properly stored essential oils will maintain their potency for a long time!" "The oils should be kept in brown or dark-colored bottles away from light, heat, and dampness. Keep the tops tightly closed when not in use." For optimal storage of essential oils, keep them in a cool, dark and dry location with the caps firmly in place. Keep them out of direct sunlight as heat, light and oxygen will destroy their medicinal properties. 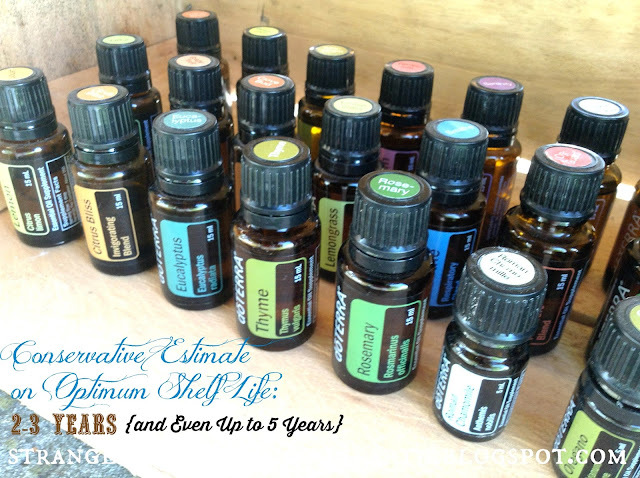 It was 15 years ago, for our first child, for our home birth, that I purchased our first set of essential oils. They were from Young Living and I splurged as this was to be my natural medication during (what was to be, a long, long, long!) labor. Now, staring at the leftover bottles which I haven't the heart to throw away, one wonders, what can you do with "expired" bottles of essential oils? 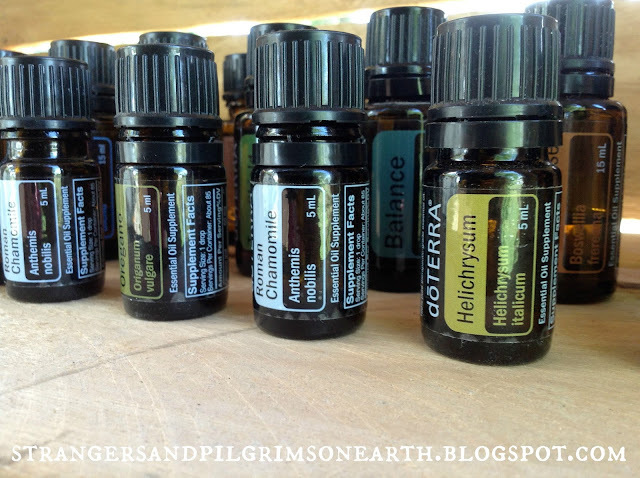 "The therapeutic life of essential oils is about two years, although some would argue that they last longer than this. Certainly their antibiotic and other properties can still be utilized in nonbody methods such as air fresheners, kitchen surface wipes, perfumes, or celebratory and gift purposes, when their aromas are a crucial aspect of their use." 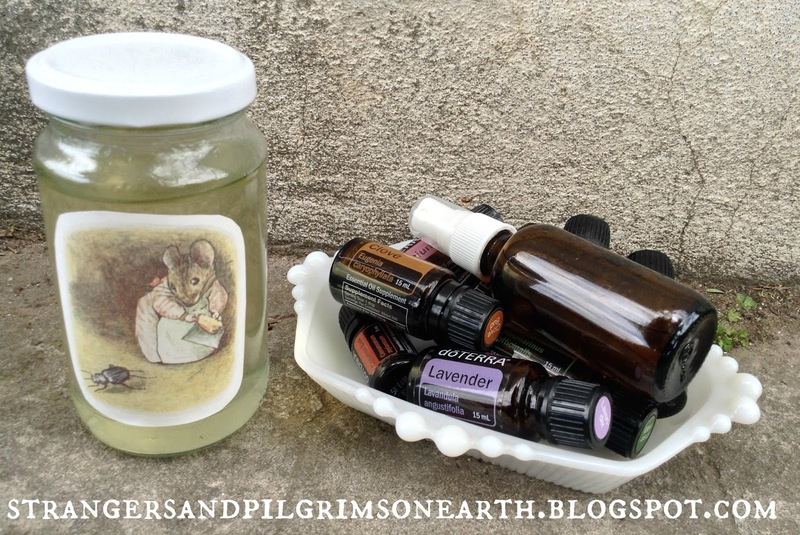 Use it in your homemade cleaners for the wonderful aromatherapy. Use it in your homemade fabric softeners. 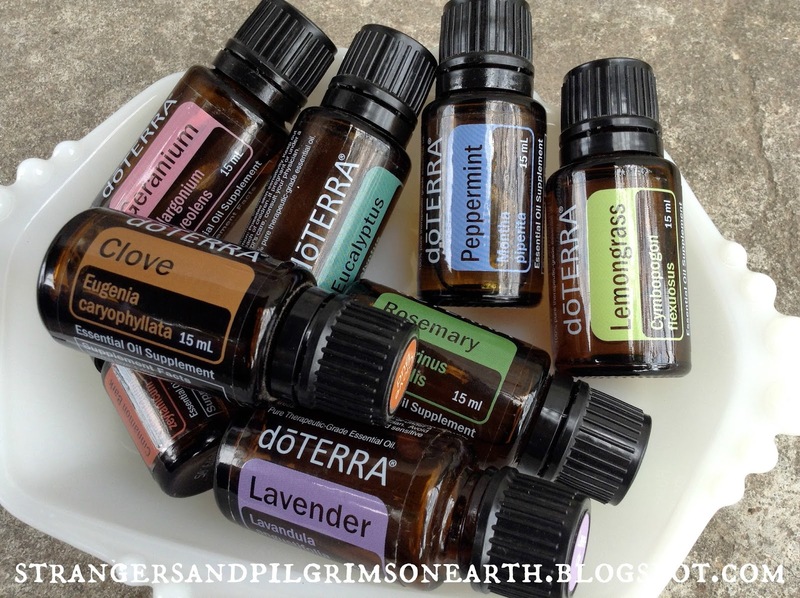 Add it into homemade potpourris to freshen up the scent. Use them in your candle making adventures (just make sure the wax cools a bit before adding). Once an unscented candle is lit, add a few drops to the oily reservoir for additional scent. Add it into handmade soaps. Use it in room sprays (approx. 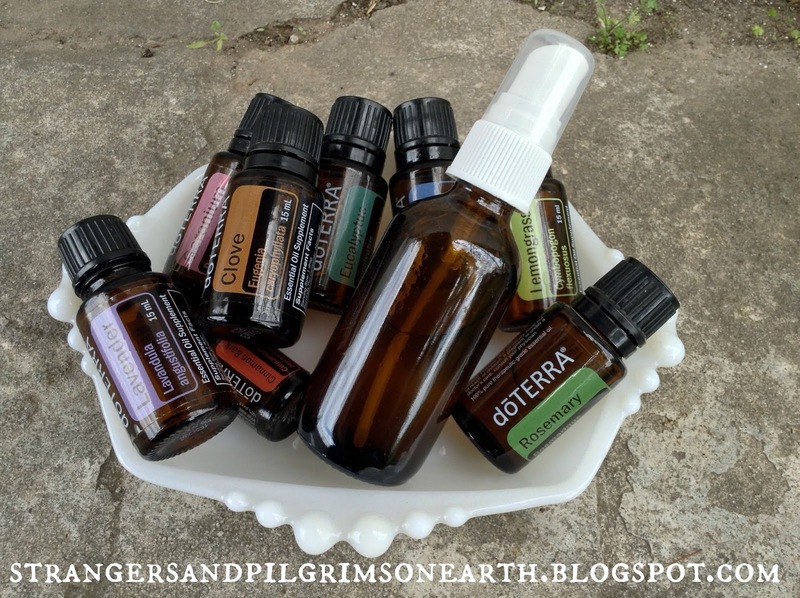 1 cup water, 10 drops of essential oil, 2 tsp. of vodka). Add a few drops onto a cotton ball and place in your drawers for a lovely scent. Add a few drops to stationary when sending a letter. Use them for traditional aromatherapy by inhaling the aroma (such as lavender to calm). Place them in diffusers for a lovely scented home. Add the seasonal scents to your firewood before burning for a luxurious fire. Add them into homemade bath salts (1 cup of epsom salt to 10 drops of oil, mix and use). Be careful to store your older oils in a separate location to make sure you use them for the utilitarian purposes we shared. Keep your current fresh supply of oils in another safe location as part of your family medicine chest. 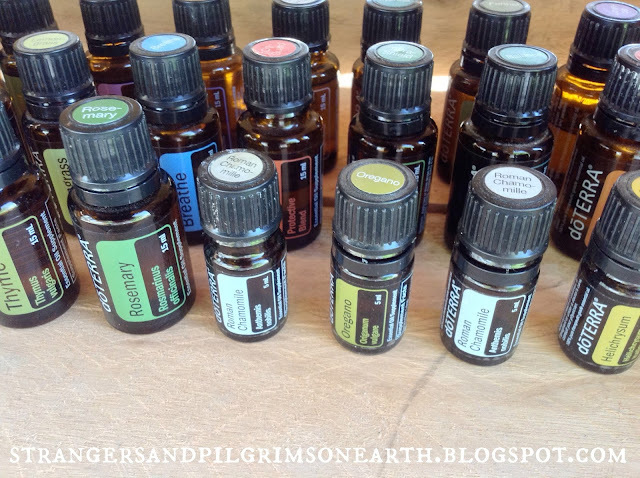 These are our most favorite essential oils. Perhaps I will share how we use them in a future post? 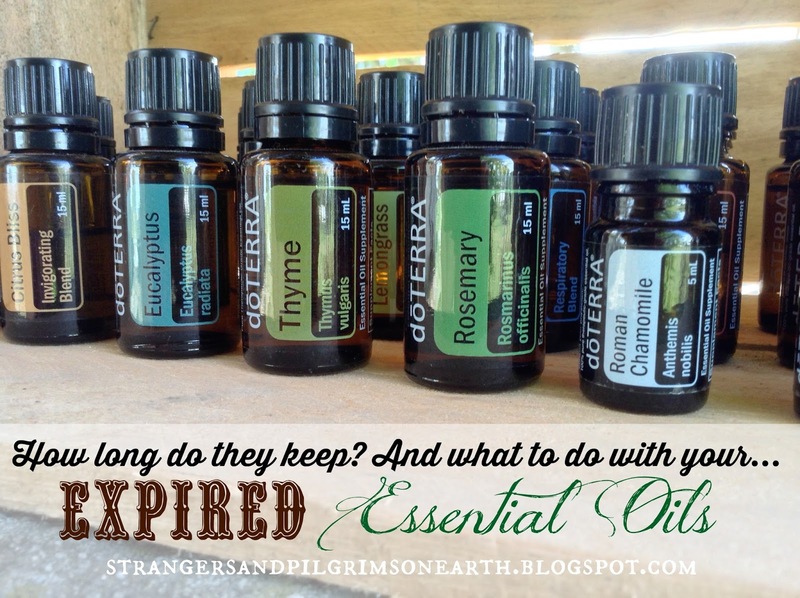 What are your favorite oil "flavors" and what other ways would you use the "expired" oils? Gleanings: web source 1, web source 2, web source 3, web source 4, web source 5, web source 6. In other news, I have been working on making the switch for this blog's printables to Google Docs since so many had troubles with the last program. 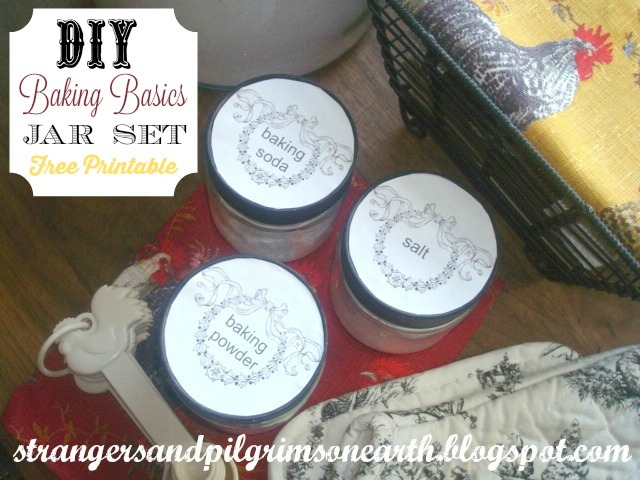 Our latest addition is our "Baking Basics Jar Set ~ Free Printable". Happy homemaking! Today she has tried something different, for that is the luxury of a homemaker. She created a "linen day". Perhaps dear reader, it was simply a melancholy moment. She brought out her Sunday best, pleased to know her Sabbath would start with a smile. She also washed the curtains, special cloths and lace-adorned runners that were sleeping in the cedar chest. She aired them on the line to dry and brought them into her home in large heaping baskets. Such a lovely fragrance filled the room as the breeze has its own fresh charm. 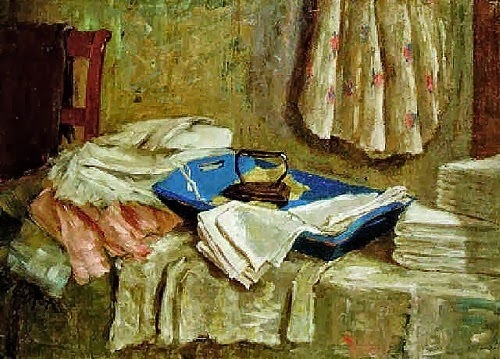 She gently places the pile of laundry on a creamy painted chair. She turns on some inspirational music and heats up her iron till it sings its lonely, sentimental song. She sets up her station. One by one, one by one... the garments and linens are placed on the board and she begins the quiet rhythm of ironing. Back and forth… back and forth. Steam hisses from the iron. Generously, she sprays her lavender water and the fabrics soak up the sweet, floral scent. She inhales and exhales the aromatherapy. Her nerves began to unwind. Her body releases its tension. Her prayers unfold as the moments go by. These simple moments remind her of more peaceful times. They remind her that being a keeper at home is a romantic vocation. They remind her that the old fashioned work of a homemaker can be a blessing when one chooses to view each occasion as one. 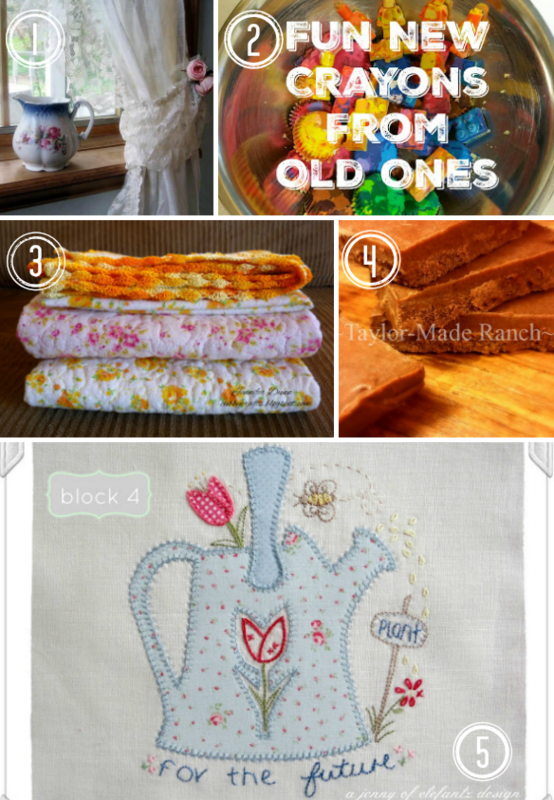 For more gentle homemaking inspiration, visit here. 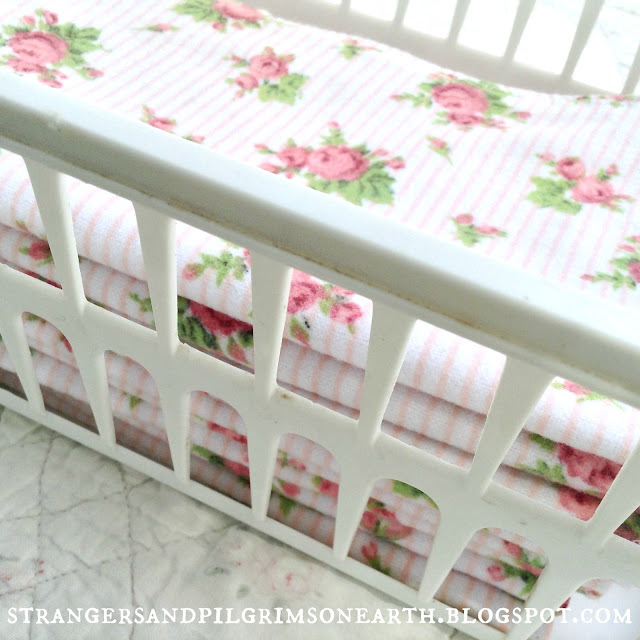 For Mimi's lovely post on how to make ironing more pleasurable, visit here. This post may be shared with some or all of the following link-ups: The Art of Home-Making Mondays, Modest Mom Monday's, Monday's Musings, Make Your Home Sing Monday, Good Morning Mondays, The Scoop, Titus 2sdays, Titus 2 Tuesdays, Tuesdays with a Twist, Raising Homemakers, Wise Woman Link Up, Homestead Blog Hop, Wow Us Wednesdays, Coffee and Conversation, Homemaking Thursdays, Home Sweet Home, Our Simple Homestead, From the Farm Blog Hop, Front Porch Friday Blog Hop, Awesome Life Friday Link Up, Five Star Frou Frou Friday, Simply Natural Saturdays and Clever Chicks Blog Hop. Thank you lovely ladies for hosting these. Painting: The Linen Room by Marie an Regteren Altena. "You can find plenty of work if you look for it; only don't look too far, because it is the little bits of things, which come right in your way, that Jesus wants you to do." 1. The Tongue is a Very Small Thing... by Teach the Younger Women ~ Can there be enough gentle reminders to keep our words in check? Shirley once again shares an inspirational post in words and pictures. 2. Fun New Crayons Made From Broken Ones by Reviews, Chews and How-To's ~ I love this idea and especially the concept of making them in fun molds! These would make darling and frugal party favors for children! 3. Soft Baby Things by My Cubby Crafts ~ I love soft and cuddly handmade gifts for baby and Jennifer shares a pretty set of goodies for her little neice! After seeing her set, I am sure you will want to prepare some for the next precious bundle in your life. 4. No-Bake Sugar-Free Peanut Butter Fudge by Taylor Made Homestead ~ Healthy dessert recipes with honey are favorites around here and this pb fudge is just the confection for our family! 5. Gentle Domesticity BOM Block 4: "Plant for the Future" by Jenny of Elefanz ~ Every month Jenny graciously shares an embroidery design. This year the theme of "Gentle Domesticity" tickles me pink. This month the freebie (that is until May 4th so pick it up soon!) is a darling garden picture with a very encouraging message. Do take a visit to her lovely blog! In other news, I have been working on making the switch for this blog's printables to Google Docs since so many had troubles with the last program. 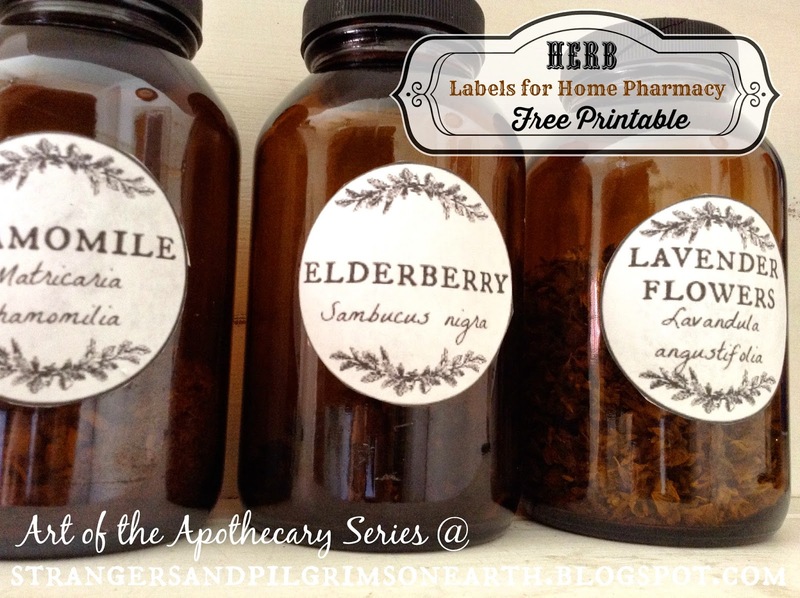 Our latest addition is our "Apothecary Herb Labels ~ Free Printable". 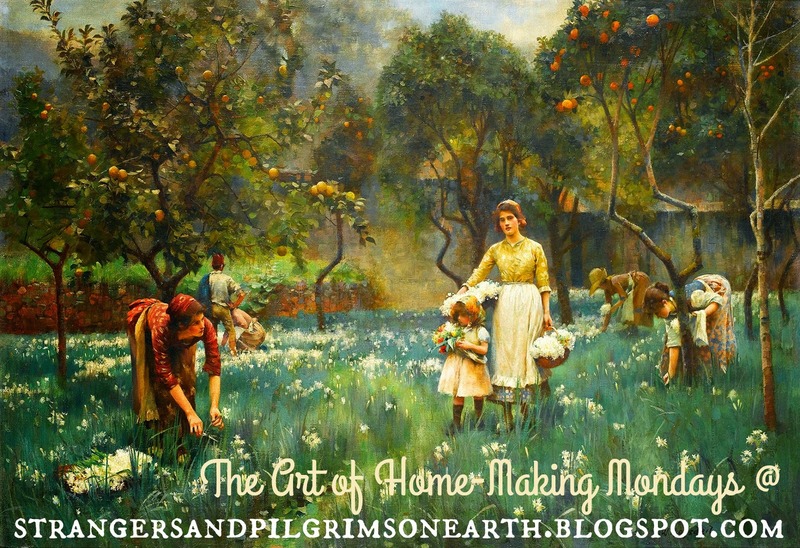 Happy herbal-homemaking! 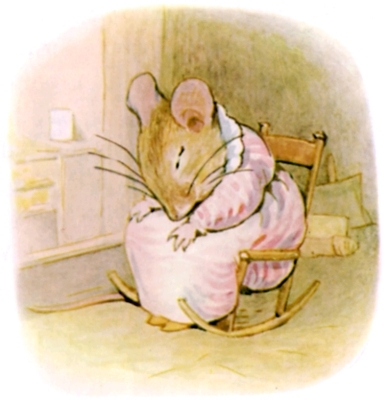 "Mrs. Tittlemouse was a most terribly tidy particular little mouse, always sweeping and dusting the soft sandy floors... Sometimes a beetle lost its way in the passages... "Shuh! shuh! little dirty feet!" said Mrs. Tittlemouse, clattering her dust-pan." 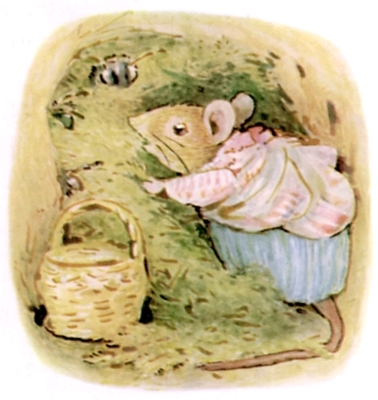 Welcome to another segment of "Fun Friday" this spring featuring Beatrix Potter Inspired Posts! Poor Mrs. Tittlemouse had been plagued by insect guests and she had had enough! Being she was a natural type of mouse, she got out her aromatherapy archives (passed down to her by her great mouse-mother) and created a "bug-be-gone" spray with the essential oils she had. She was certainly not interested in using the toxic, chemical sprays they sold in the mouse-market. Oh, no! She was no lab rat! She was a respectable country mouse! 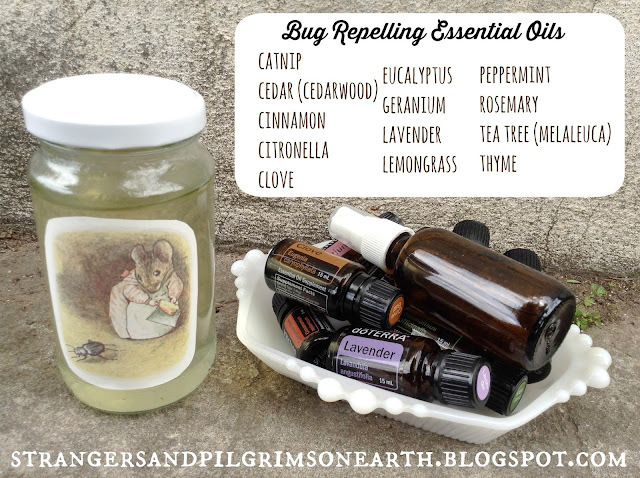 Though Thomasina's (that is her Christian name of course) bugs may be of a different concern than our own, I think you will find her recipe to be quite helpful in deterring the insects (mosquitoes, horseflies, gnats, etc.) that us humans find rather upsetting. Shake spritzer bottle well before each use. Reapply every 30 minutes for best results. For a well-rounded blend that will not only deter mosquitoes but also gnats, horseflies and ticks, make sure to include peppermint, eucalyptus and rose geranium in your mix. If using the insect repellant for children six and under, consider using a combination (or a mix of a few) of the child-approved oils of lavender, tea tree, thyme, geranium and rosemary. 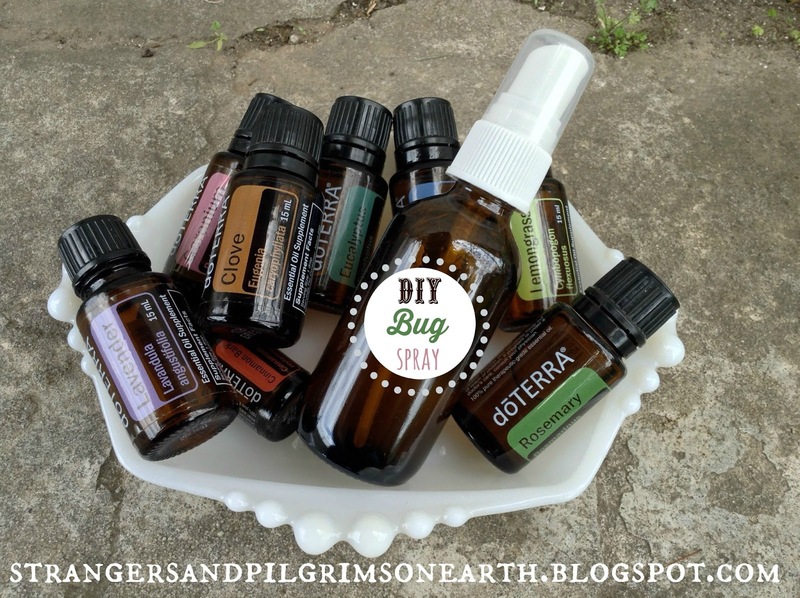 You can also mix 1/2 cup of soybean base oil (which has bug-repelling properties itself) with the 60 drops of your chosen essential oils (easy on the cinnamon if you use it). Let mixture sit for an hour before applying. To use, massage oil into areas that require skin protection. This will last up to one year if properly stored in a dry, cool, dark place. Alternatively, mix together 1/3 cup of vodka with your 60 drops of bug repelling essential oils. Then add 1 tsp. vegetable glycerin and 2 cups distilled (or boiled and cooled) water. Shake well before each use. Reapply every 30 minutes for best results. Notes: Though lemon essential oil may be found on some bug-repellent lists, because it is phototoxic (it could cause alterations to your skin pigmentation if exposed to the sun shortly after application), I don't think it a good choice for outdoor day-use and therefore didn't include it. "Mrs. tittlemouse began to pull out the moss. Three or four other bees put their heads out, and buzzed fiercely. "I am not in the habit of letting lodgings; this is an intrusion!" said Mrs. Tittlemouse. 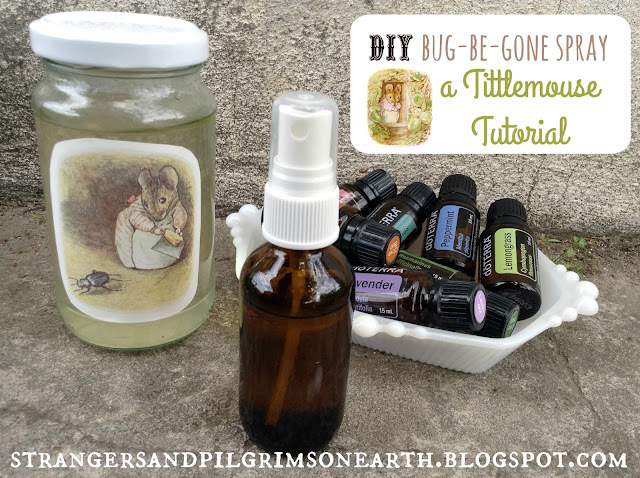 "I will have them turned out—"
You will find our printable "insect repellent recipe" HERE. Perhaps you would like to place it in your "Manual of Household Hints and Delights"? This is simply a safe place you can store all of Mrs. Tittlemouse's homemaking printables to have them handy until you are ready to use them (lots of fun goodies will be coming your way). You could also think of it as a "printable portfolio" collection to store all your favorite printables. You will find the free download here if you are interested. The cover page is designed to slide into the front of the binder as a title page insert. The tabs are best printed on card stock, affixed with glue to card stock and staggered as you attach them. It is just a bit of extra fun! 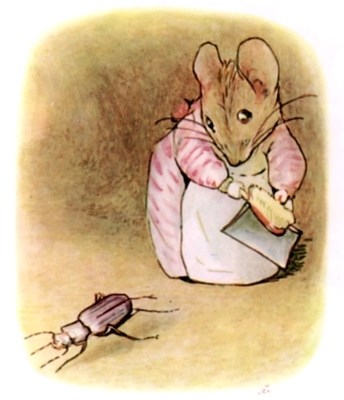 Mrs. Tittlemouse gleaned some of her insect repellant information from the following sources: The Complete Book of Essential Oils and Aromatherapy, Organic Body Care Recipes and The Herbal Academy of New England. 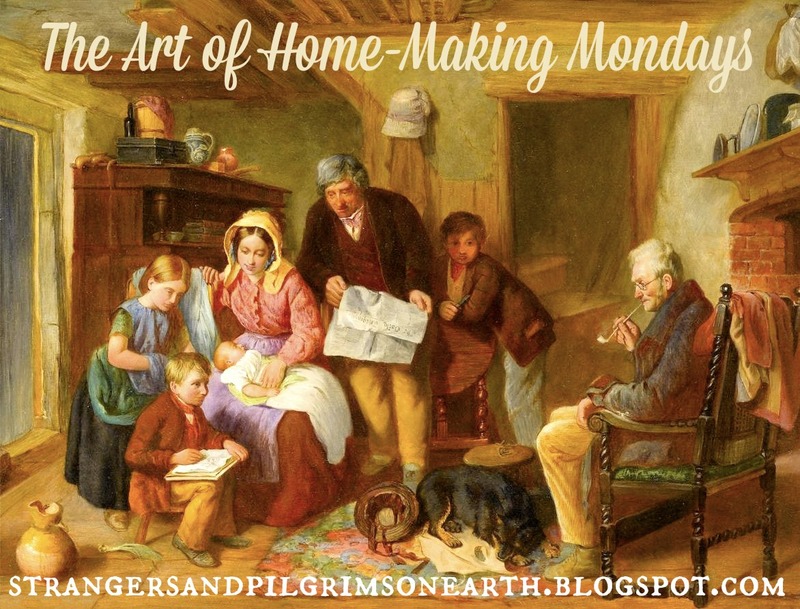 This post may be shared with some or all of the following link-ups: The Art of Home-Making Mondays, Modest Mom Monday's, Monday's Musings, Make Your Home Sing Monday, Good Morning Mondays, The Scoop, Titus 2sdays, Titus 2 Tuesdays, Tuesdays with a Twist, Raising Homemakers, Wise Woman Link Up, Homestead Blog Hop, Wow Us Wednesdays, Coffee and Conversation, Homemaking Thursdays, Home Sweet Home, Our Simple Homestead, From the Farm Blog Hop, Front Porch Friday Blog Hop, Awesome Life Friday Link Up, Five Star Frou Frou Friday, Shabbilicious Friday, Simply Natural Saturdays and Clever Chicks Blog Hop. Thank you lovely ladies for hosting these. This post contains affiliate links and any purchases made through them help to support this little blog.